Increasing demand for seafood products in remote areas has propelled the production of frozen seafood products. Companies producing frozen seafood products are actively dependent on the cold storage region, which continues to be a major impediment for the market. Robust cold chain infrastructure is deemed profitable for the distribution of frozen seafood, however, the inconsistency in the quality of these storage services continues to create problems for companies. Leading players in the global frozen seafood market are adopting advanced processing techniques to increasing the endurance of the products against external factors such as changing weathers, mechanical damage, and fluctuations in freezing temperatures. According to Transparency Market Research, several factors are expected to impede the growth of the global frozen seafood market in the years to come. Primarily, complexities in the processing techniques for production of frozen seafood products is expected to challenge the business prospects of the companies. In addition, lack of standardization in terms of employing freezing temperatures, storing frozen seafood products across different levels of refrigeration, and applying proper seafood preservatives will continue to constrain the sales of frozen seafood across the globe. 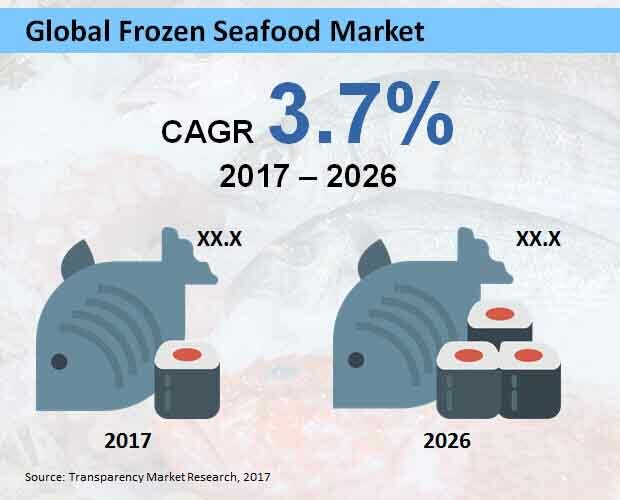 The forecast study developed by Transparency Market Research projects that over the forecast period, 2017-2026, the global frozen seafood market will expand at a sluggish CAGR of 3.7%. The report further estimates that by the end of 2026, the global frozen seafood market will reach a valuation of US$ 32 Bn. Several products are being sold in the global frozen seafood market, among which crustaceans are expected to emerge as top-sellers. In 2017, around US$ 8 Bn worth of frozen crustaceans are estimated to be sold around the world. High profit margins associated with crustaceans and increasing demand for exotic seafood products will collectively factor the growing sales of frozen crustaceans. The report also projects that sales of frozen fishes will account for nearly 30% of the overall global frozen seafood sales throughout the forecast period. Relatively less complex storage of frozen fishes will drive their distribution, and consumers will also remain more inclined towards cooking frozen fishes through simple preparation techniques and nascent level of thawing. The end-use of frozen seafood will remain predominant across food chain services. Popular restaurant chains such as Long John Silver’s and Red Lobster, among others, will continue to opt for frozen seafood over fresh seafood. In the foreseeable future, major companies producing frozen seafood products will be eyeing for strategic tie-ups with multinational food chain services. The report estimates that by the end of 2026, nearly 40% of the overall sales of frozen seafood products will be accounted by food chain services. The report further projects that the modern trade outlets will register fastest sales of frozen seafood products over the forecast period. Increasing adoption of frozen seafood products in domestic households will drive their sales across modern trade outlets. Equipped with advanced refrigeration apparatus, these outlets will serve effectively in providing high quality frozen seafood products to the common consumer. The report also reveals that companies namely, AquaChile, Clearwater Seafood, High Liner Foods, Iglo Group, Leroy Seafood, Marine Harvest ASA, Nomad Foods Europe, Beijing Princess Seafood International Trading, Thai Union Frozen Products, and Grupo Pescanova will be observed as the leaders in production of frozen seafood. These players will instrument the growth of the global frozen seafood market through 2026. Being one of the richest source of high quality protein, seafood continues to be served across local dietary cultures in several parts of the world. However, meeting the demands of consumers in places with low accessibility to fresh seafood products has driven the demand for frozen seafood. Seafood producers in all parts of the world are integrating the refrigeration infrastructure to ensure that the quality and fine taste of their products is not comprised by changing weathers, temperature fluctuations, and other external factors. However, inconsistency in the cold storage infrastructure across regional markets and local vendors continues to jeopardize the transportation of frozen seafood. Serving frozen seafood through safety guidelines is also becoming a mandate, which has created a certain amount of disinterest among consumers. A recently published report by Transparency Market Research has considered several factors encompassing the backdrop of the global frozen seafood market. From increasing prices of raw materials to fluctuating costs of refrigeration and storage services, the report has analyzed the expansion of the global frozen seafood market with a trade perspective. By providing objective information on the future prospects of frozen seafood, the report creates a roadmap that can enable market players in taking informed decisions for the near future. Key sections of the report provide segmental analysis on the global frozen seafood market. The global market for frozen seafood has been segmented on the basis of product-type, end-users, and region. The global frozen seafood market taxonomy has been illustrated in the table below. The report also offers additional information of country-specific market forecasts and cross-segmental analysis. Qualitative insight analysis provided in the report gauges the impact of factors such as industry trends, growth drivers, adoption restraints, and marketing opportunities on the expansion of the global frozen seafood market. The report has delivered a comprehensive analysis on the global frozen seafood supply chain and value chain. Macro-economic factors have been addressed and the report has further compiled an intensity map that reveals the presence of market participants across different regions. The key scope of this report is to develop presumptive scenarios on the future of global frozen seafood market and deliver validated analysis to market participants. This information is aimed to influence the strategies of frozen seafood producers and suppliers across the globe. The report has been developed by statistical data repurposing, implementation of industry knowledge, and extrapolation of research acquired from multiple sources. In-depth consumer research and primary data analysis provided in the report are directed to serve the queries of companies partaking in the expansion of the global frozen seafood market. Furthermore, a detailed competition assessment has been offered in the report to provide a snapshot of the leading players, emerging companies, and established producers. The report reveals the strategic developments of each company, which can be of great advantage for market players aiming at beating their rivals through profound business development. Inferences in the study are developed through custom analysis and this data has been procured from the opinions of leading trade analysts, subject matter experts and research consultants associated with Transparency Market Research.